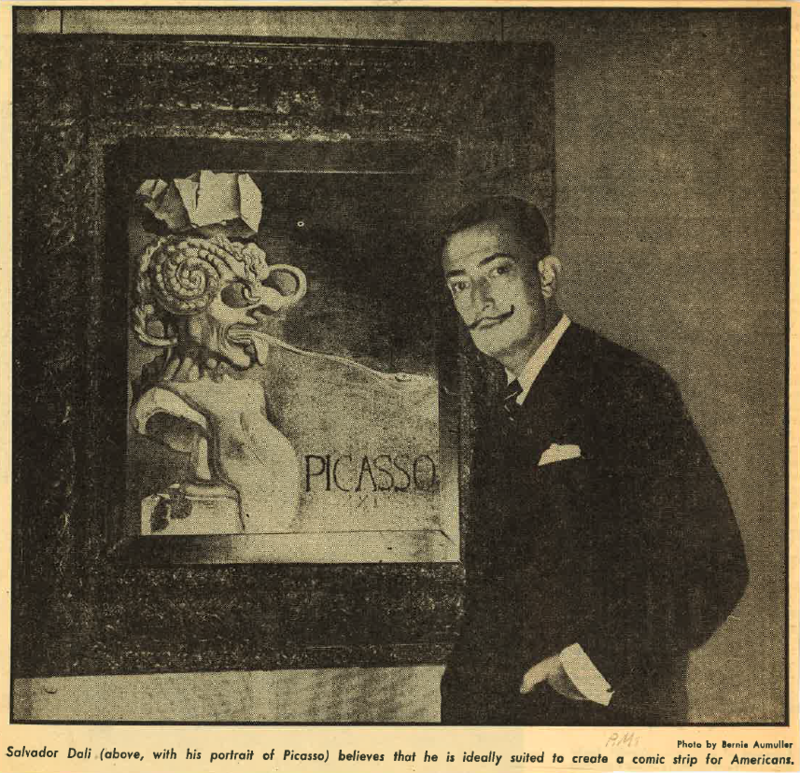 “Salvador Dali (above, pictured with his portrait of Picasso) believes that he is ideally suited to create a comic strip for Americans”– Hirshhorn Museum and Sculpture Garden Library. The world of modern art is at times criticized for a certain reputation of exclusivity and mystery in which the more inaccessible a certain artist or artwork may be, the more valuable and reputable the art becomes. Salvador Dali, the most famed member of the twentieth century avant-garde movement, Surrealism, on the other hand, challenges this perception that artistic creation is a closed-off affair for an elite few. Sure, Dali was no humble man of the people, and in fact is famous for his eccentric, narcissistic personality as he continually declared himself the most talented and significant artist of his generation (let’s not forget his autobiography graciously titled Diary of a Genius). However, Dali walks the line between artist and popular culture sensation as he created artwork that was meant to be seen and consumed by everyone. Many examples of Dali’s remarkable work may be found in the Art and Artists Files of the Hirshhorn Museum and Sculpture Garden Library and the American Art & Portrait Gallery Library at the Smithsonian, as well as the nearby National Gallery of Art Library. This entry was written by Linda Blancato, book lover and Adopt-a-Book supporter. In honor of National Aviation Day, Smithsonian Libraries (SIL) turns to a piece of history found in the Ramsey Room. Established by Franklin Delano Roosevelt in 1939, National Aviation Day is celebrated every year on August 19th, which is also the birthday of Orville Wright. On Friday, August 7th, the Smithsonian Libraries and the National Museum of American History hosted a tweetup in the recently renovated Innovation wing (First Floor, West) of the museum. Fifteen Twitter followers joined us for special curator-led tours of Patrick F. Taylor Foundation Object Project, Fantastic Worlds: Science and Fiction, 1780-1910 and the Dibner Library of the History of Science and Technology. The group of tweeters represented a fun mix of educators, book lovers, and history enthusiasts. Participants came from as far away as Kansas and Connecticut!